Connections is an innovative program, built from the ground up with a growth-mindset approach to college and career success. Written by counseling psychologists Paul Gore, Wade Leuwerke, and A.J. 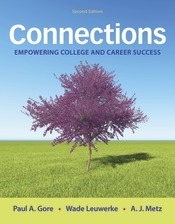 Metz, Connections shows students from day one how to be learners, whose mindset, drive, and strengths will help them meet any challenge on their way to college, personal, and career success. The expertly designed program is firmly rooted in the most current research in positive psychology, using self-reflection as a tool for goal-setting; goal-setting as a tool for imagining one's potential; and imagining one's potential as the motivation for realizing it. Connections puts students at the center of their own personalized learning path, facilitates their purposeful choice of an academic and career plan, and develops all the skills they need--cognitive and non-cognitive, academic and life--to foster their self-growth and success. Built around the most common issues faced in the classroom, LaunchPad for Connections, Second Edition gives students everything they need to prepare for class and exams, including author-developed digital tools linked directly to the eBook, the ACES student self-assessment (taken at the start and end of term), and our acclaimed LearningCurve adaptive quizzing. For instructors, LaunchPad offers everything they need to quickly set up a course, customize the content, prepare presentations and lectures, assign and assess homework, and guide the progress of individual students and the class as a whole.